WANNABEE excels at building (and rebuilding) fortifications. Broken concrete, shattered glass, you name it. 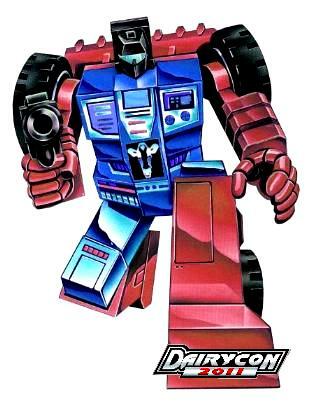 He is usually called in to repair damaged human settlements after a particularly nasty Autobot/Decepticon battle. His ability to blend into the local enviornment is quite good. Overactive cheerfulness does not mask his distinct inability to be a leader. Some follow him simply to shut him up. Usually the first to be shot at in battle. Often bickers with his twin brother POSER; arguments and lack of ability seem to be at the Nexus of his problems.